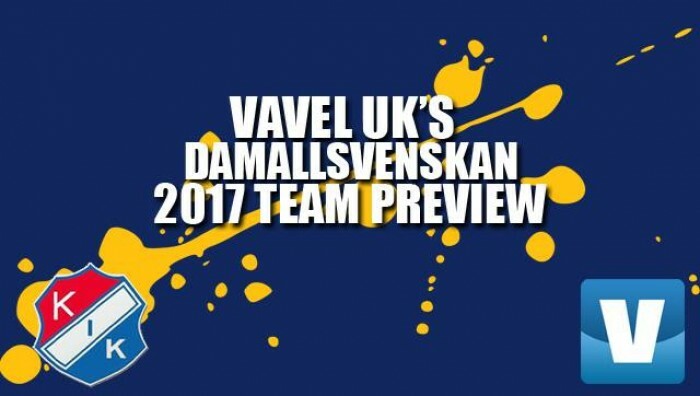 With a number of big profiles leaving there’s a lot of uncertainty around Kvarnsveden heading into the new season. Kvarnsveden (KIK) finished a respectable 9th place in the league, 10 points from relegation, last season. It was their first ever season in the top flight, and many predicted them to struggle, but when push came to shove, they were never really in danger of relegation. They ended the season with five wins, eight draws and nine losses. Their goal tally was impressive, as they managed to find the back of the net 30 times. To compare, Eskilstuna United, who finished 3rd, scored 34 times. A huge contributor to that was Tabitha Chawinga who scored half of the team’s goals, and was the third most scoring player in the league – above a player like Marta. Defensively it wasn’t as positive, as they let in 48 goals. Only one team let in more. KIK have lost a number of the players who shone in the clubs first ever Damallsvenskan season. Michaela Hermansson has retired, which is a huge loss, not only to KIK but the league. She was one of the positive surprises in the league last season, and arguably one of the best left backs. She leaves a massive void, that many aren't sure KIK have fixed. Tiffany Weimer has joined Boston Breakers. She only played half a season for KIK, but her impact was immediate. She added some oomph to the squad and she lifted everyone around her. Meghan Toohey is perhaps the biggest loss this offseason. She rarely, if ever, had a bad game, and constantly delivered at a very high standard. They have also lost goalkeeper Adelaide Gay and midfielder Sarah Elnicky who have both joined ÍBV in Iceland. Both were regular starters. Caroline Lundberg have also retired. Lastly, Joanna Snell has joined Falu BS. Lara Ivanuša has been brought in from ŽNK Olimpija while Armisa Kuć and Melisa Hasanbegović have both come to KIK from SFK 2000 Sarajevo. Ivanuša is a young Slovenian player who is probably going to slot in as an offensive midfielder. Kuć is also an attacking minded player with a good physique, not a bad trait to have in a league like this. Hasanbegović is a defender with good aerial presence, and given their defensive record last season, this isn’t a bad addition to the team. Both Kuć and Hasanbegović brings experience from the UEFA Women's Champions League. There’s a lot of uncertainties around KIK going into the season. They’ve lost a number of important players, and the three they have acquired are untested at this level. They still have a very capable attack led by Chawinga, but the defence is still a worry. Hermansson will be a big loss, and it’s still to be seen what Melisa Hasanbegović can add to the team defensively. All in all, it’s hard to predict where they will end up in the table, but my bet would be a lower half finish, where, depending on how the promoted teams get going, they could get drawn into the relegation fight. A lot rests on the shoulders of Chawinga. To the surprise of possibly no-one, Chawinga is the player to watch. In her first season for KIK she scored an incredible 43 goals in Elitettan which was a huge part of KIK ensuring promotion to Damallsvenskan. She followed that season up with 15 goals last season, which earned her a nomination as the most valuable player in the league. She’s a player that makes things happen. Other than Chawinga, would keep an eye out for Robyn Decker. She can play both in defense and midfield, and has had a good preseason so far. With all the departures, someone like her will be even more important.